Pretty much everyone has either been the creator, target, or independent observer of a note like this one. 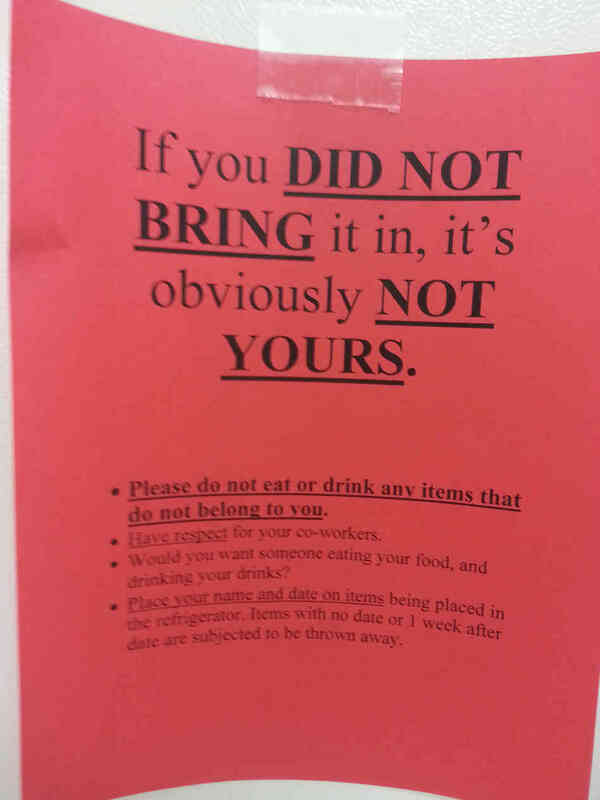 It's the classic "DON'T TOUCH MY THINGS" notice, though just a little more reserved than the usual. Here's one that's a little more intense. This one comes with a response. Here's one written on a plate. This one on painters tape. 1. Name and Date: The tried and true. Writing "This is Steve's" won't dissuade every potential food burglar, but putting a name to the potential victim will certainly stall others. Placing a nondescript to-go container full of fried rice in the fridge is dangerous. Labeling that fried rice at least tells people "nuh uh, Steve says 'don't you dare!'" 2. Divert the Curious: If your food container isn't clear tupperware, wayward hands may seek to test the lengths of their imagination and open it up for a peek. Write something gross or offputting on the container to divert them. They're much less likely to investigate something that says "chicken liver" or "french fried frog" or "Raw Ammonia: Do Not Eat." This is a terrific trick for protecting that aforementioned nondescript to-go container of fried rice. Or chicken piccata. Or beef bourguignon. Really, anything you don't want others to take, do your best to make look unappealing. 3. The Pre-emptive Strike: This is a great mind game. 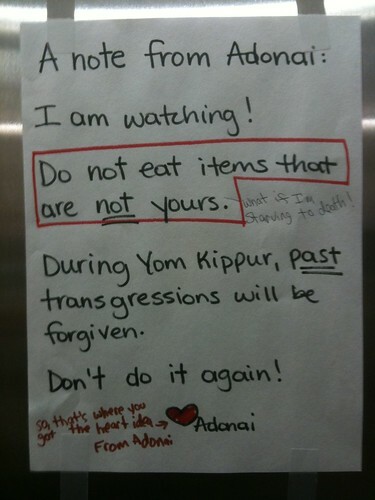 Write a note declaring your disgust for a food thief (like the ones above) but don't sign your name. 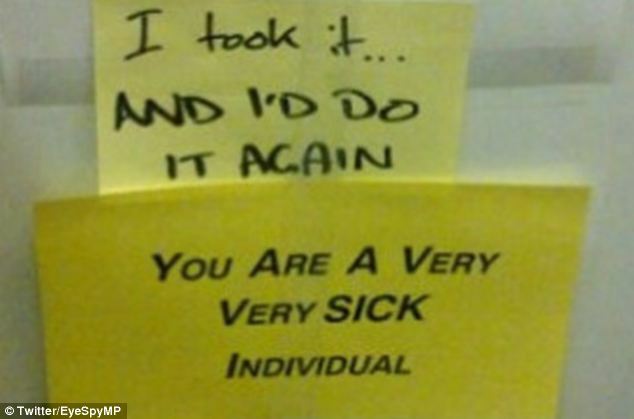 Maybe even disguise your handwriting so no one suspects it was you. 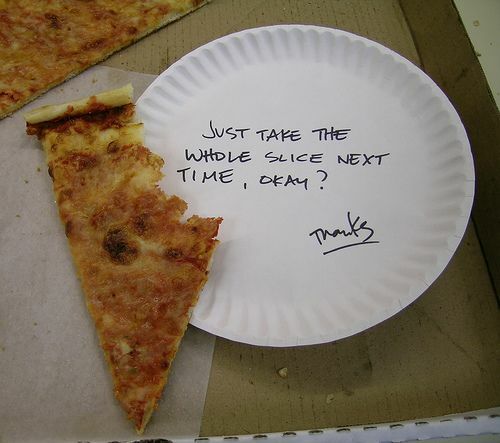 Place it in the fridge and wait for your co-workers or housemates or whomever to drum up conversation. Then, feel free to store whatever you want in there. I'm serious. You can store bearer bonds in that fridge and feel safe. Now that it's clear there's a "culprit" on the loose, everyone will be extra wary and no one will dare try and swipe your stuff lest they be accused of a prior, fictitious crime.